Every time the autumn arrives, I notice the temperature changes quite rapidly. Not for us the late summer in autumn that we have enjoyed in the past! This year we are straight down to business, with colder and damper weather leading us into wintertime. Coats are on sale everywhere, and not just for humans. After the dressing up costumes of Hallowe’en, we now have the winter jumpers and Christmas gear, but also plenty of dog coats available. ‘They already have coats’ I hear you cry. Yes indeed, our dogs are covered in fur. If you compare a Pinscher or Weimaraner to a Border Collie, however, you can see that those coats vary hugely. A light covering of fur is not going to insulate your pooch as much as the heaviest of Golden Retriever fluffiness. If you decide your dog might be feeling the cold, aim for a rain-protective and padded coat. Ensure that your dog can still move freely in it, as it can be a little overwhelming for them at first. Fleeces are available, with leg ‘sleeves’ that are brilliant for Greyhounds and others that simply do not have nature’s furry coating. It is only fair that a very young dog gets additional help in keeping warm especially on damp, rainy days. A puppy’s coat is naturally lighter and fluffier, even if their future fur is going to be thick and warm. In addition we all know that getting older brings aches and pains in colder weather, so your elderly dog, who may have survived happily through all the preceding years, might start to appreciate another layer. Dog coats can be bought on a budget, or can be very costly. My advice is to start with a slightly less pricey, or second-hand coat or jumper. They are not great quality but I would not want you to spend a lot of money if your dog dislikes it. Once you have spent time accustoming your dog to the new sensation, they will appreciate it, and you can then purchase something a little more high quality, perhaps. Waterproof coats can be treated fabric rather than noisy, sweaty, crinkly plastic versions, so shop around! You may currently be complaining as many dogs appear to moult at this time of year, possibly due to the central heating coming on. Nonetheless, keeping their coat in good condition means that whatever fur they do have will help protect them from the cold. Judging by the amount of coat my little dog Pickles is currently shedding, I could probably knit us both a new one. Noel Edmonds supports positive dog training! My article on positive dog training was invited, and posted, in less than a day. As we all know, Noel is well-known and much loved, pursuing a noble goal of spreading more positivity in the world with his Positivity Radio app and website, where you can listen to lots of different genres, no adverts, and most of all, always buoyant and happy listening. Now that lovely Noel has welcomed positive dog training views under his wing, let’s spread the word even further. This is an unstoppable force, a revolution in kindness. Positive, reward-based training for the world? DEAL! 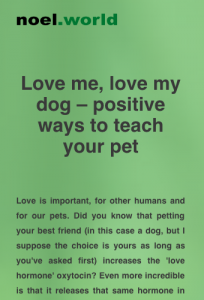 Karen’s new book ‘Being a dog’ is available on PRE-ORDER here! Lead by example – what dog lead do you need? What sort of lead would be best for your dog? They spend a lot of time wearing these and we spend a lot of time holding the other end, so it is worth examining what might suit your needs. We have a collection of all shapes and sizes, and colours too. As we have four dogs they each appear to collect additional leads as they grow, plus leads belonging to beloved dogs from the past. Do I need a lead? YES. In spite of protestations that your dog may be under control near roads, you cannot guarantee this. Never, ever let them walk near a road without a lead on. It really isn’t worth the risk to your dog (or to anyone else for that matter, should your dog get spooked, attacked, or chase a cat and run into the road). Bungee leads. These have a piece of elastic or similar which stretches as the dog pulls. Great if you have a dog that tends to lurch forward suddenly. However, the delay they allow can be very risky as it reduces the control you have over timing your responses. I would not recommend these with an untrained dog (come and see me for a lesson on walking nicely on lead, or download my training guide perhaps)! The ‘flat’ lead. This is the essential piece of any dog owner’s kit. Unless you are very tall, or short, the normal length of such a lead is around 4 feet. Any longer and you will have to gather up a lot of slack when your dog is close to you (as they should be, of course). Any shorter and you are potentially one of the ‘tight lead, stressed dog’ brigade, which we do not want either. A flat lead should be made of a really comfortable material. Leads that hurt or burn your hands aren’t a good prospect. You need to move your dog safely, and may need to grab the length of the lead and not just the handle. Choose a soft lead that is strong and that does not stretch when handled, as this causes a delayed response at the other end. Rope leads cause choking and damage and should never be used with a dog that pulls. There are many kinder and safer devices to use! The very best material for a lead of this type is bridle leather. These are expensive but last and last. Bridle leather gets better in the wet, never brittle, very comfortable to hold along its length and well worth the investment. They also come in many colours! Ours (made by saddler, Ginny Pestell) is fifteen years old and is still going strong. It is very soft and pliable and I would be devastated to lose it. Retractable leads. These are sometimes known as a Flexi lead and retract back into a plastic handle, held by a trigger button. 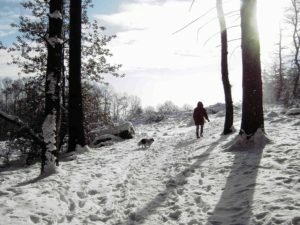 Good for ‘easy’ walks with a dog that may have an unreliable recall, in areas well away from roads. They can be very risky if your dog is too large for the lead strength, or if they become entangled around legs of dog and human alike! If you have a fast dog, a retractable lead is extremely dangerous! Go through your lead collection and sort out what you love, a lead you enjoy using and perhaps consider donating any that you no longer use to your local rescue shelter. This goes for all equipment, coats, dog beds and blankets. If you don’t use it, take it out of the cupboard and rehome it. There is always a dog that will be grateful! Bigger than it looks here! The new self-closing Treat Bag by Dicky Bag. The latest Dicky Bag innovation – a self-closing treat bag! 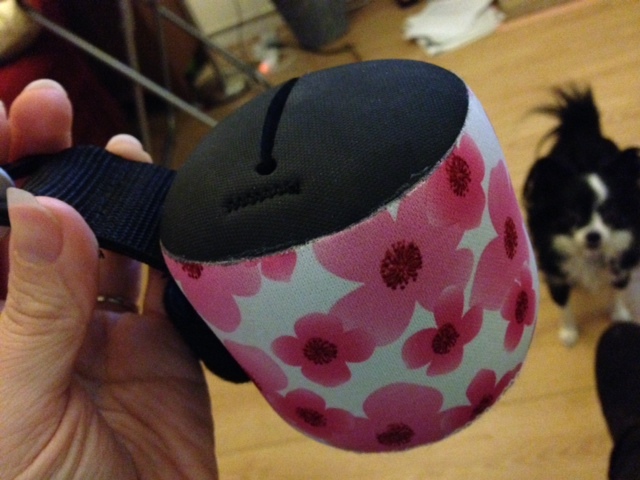 The Dicky Bag team have not only given us somewhere easy, soft and hygenic to carry those dog poo moments whilst still on our walks, now the design team has come up with my latest favourite for dog training. The Dicky Bag Treat Bag has a slot in the top made in the same neoprene material as their other products. Easy open and easy close, by just reaching into the slot. I decided to put it on test and here are the results! – Containment of treats when you walk, run, bend or move about whilst training. The Dicky Bag Treat Bag meant I could easily get to the treats (we used chopped up dried meat pieces mixed with kibble). As the treats pull out, the opening simply closes so you only get out what you are holding. No more fumbly treat delivery. Result – economical/no waste! The treat bag has a large, secure carabiner clip and is stitched firmly. It is lightweight so easy to forget you are wearing it, but I felt like it was securely clipped onto my belt. Result – phew! If you are anything like me, you leave treats in the bag and forget about them. This makes rediscovery always rather interesting! I found that because the Dicky Bag treat bag was a neoprene, it was so easy to clean and didn’t suffer at all. The flowery pink design still looks very nice although there are other designs available (a blue version and also camouflage, amongst others). Result – guilt-free cleaning and a nice looking bag no matter what I do to it. Price – not the cheapest on the market but the only one I am ever going to use from now on, so worth every penny as it is so future-proof and Karen-proof! I tend to use my treat bags as search items and targets for my dogs when training them to move ahead, but the drawstring ones are too flimsy to allow them to pick them up for me. I am going to try the Dicky Bag version and see how this goes, as I think it is sturdy enough. Dicky Bag have been asked if they do horse-sized ones so this is also in the pipeline. Each bag is hand made over here in Britain so, yes, I am biased, this is a terrific product and another leap forward in the dog training product world. Thank you Dicky Bag for making life easier for us! I’m a full-time U.K. dog trainer and behaviour consultant based in Peterborough with 17 years in the field. My work ranges from class teaching, obedience, flyball, agility and working trials, competition, to running a popular dog display team. Please do not hesitate to contact me if you would like to discuss hiring me to speak at your event or write for your publication. To find out more, click here. My commitment to you and your dog is assured by my professional qualifications. To find out more, click here.